For the 2018/19 school year, we have 14 classes; 2 each for grades kindergarten through fifth grade and 1 sixth grade all at Azevada Elementary School. Additionally, there is 1 seventh grade class at Hopkins Jr. High School. There are about 350 children in the program now. With the current level of interest in this program, we project to add two new classes each year until there are 2 classrooms in each grade level through 8th grade for a total of 18 classes. According to a March 2017 survey of parents representing 69% of the children in the program, 73% of the families speak English, 15% speak Mandarin, and 9% speak Cantonese as primary languages at home. 59% of the families surveyed also speak a second language in the home at least 10% of the time. Other languages spoken either as the primary or secondary language at home include English, Mandarin, Cantonese, Spanish, Taiwanese, Burmese, Vietnamese, Japanese, Gujarati, and American Sign Language. Immersion education is an alternative educational model designed to provide students with fluency and literacy in two languages. In this program all students develop literacy in Mandarin first with the gradual addition of English. 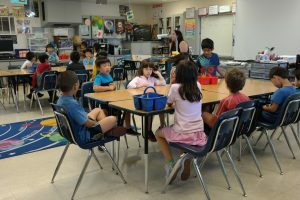 Students in the Immersion Program are taught the same California State standards as all other students in the district, at the same grade level, with the exception that the students in this program are taught in the Mandarin language for most of the school day. English is taught daily and the students are encouraged to interact in both languages. The language immersion approach is a proven, effective method in providing children with a well-rounded, academically excellent education and full mastery of both English and any target language. Several Bay Area public and private schools, including schools in Palo Alto, Cupertino, Berkeley, Los Altos, Hayward, and San Francisco, have reported phenomenal academic success in Chinese Immersion programs (CIP) and more and more are being established across the nation. First language acquisition, cognition and social awareness go hand in hand in young children. By integrating language and content, foreign language learning, too, becomes an integral part of a child’s social and cognitive development. Formal and functional characteristics of language change from one context to another. An integrated language and content model in an elementary school setting provides a wide variety of contexts in which to use the foreign language. Is Mandarin Immersion Right for Your Child? • Do you value bilingualism, bi-literacy, and diversity? • Does your child need challenges? • Do you want your child to have a linguistic edge in tomorrow’s global market economy? • Are you willing to make a long-term commitment to the Immersion Program?